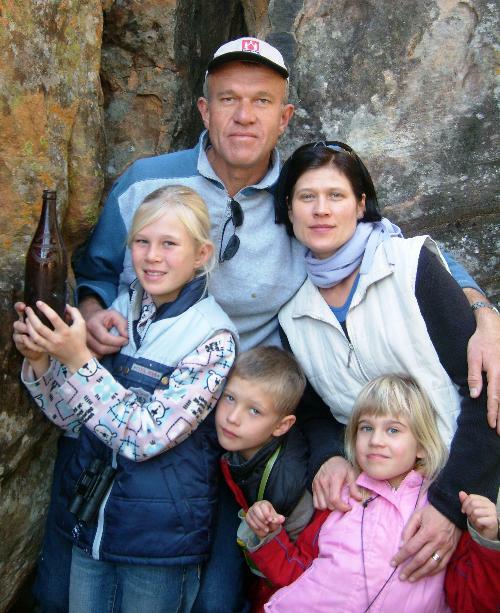 Gerhard was born in Namibia. On the photo below you see us on the farm between the rocks, where his grandfather used to hide a bottle with water in case of emergency. Naemi our daughter is holding this original bottle in her hands. Gerhard is a qualified tour guide and organizes also individual private tours in South Africa, Namibia and Victoria Falls. Helga was born in Austria and since 1995 in South Africa. Our children Naemi, Stephanie and Tristan Max were all born in South Africa. We would like to share this beautiful country with you and welcome you in our Garden Cottage. Please email us or give us a call for a quote.